Members of Canada’s social, political and diplomatic elite came together to celebrate the African Institute for Mathematical Sciences (AIMS) alumnion its 10th anniversary. The event took place in Ottawa, Canada on November 6. The Government of Canada is one of AIMS’s largest financial supporter through the International Development Research Centre (IDRC). In the presence of His Excellency the Right Honourable David Johnston, Governor General of Canada, AIMS chairman and founder Prof. Neil Turok and executive director Thierry Zomahoun celebrated AIMS alumni at an event Nov. 6 at the Chateau Laurier hosted by the International Development Research Centre (IDRC). Also in attendance where His Excellency, ANU’A-GHEYLE Solomon AZOH-MBI, High Commissioner for the Republic of Cameroon in Canada; the Hon. Peter Braid, Member of Parliament for the Government of Canada; the Hon. Hélène Laverdière, Opposition Member of Parliament of Canada; Jean Lebel, President of the International Development Research Centre; and Denis Desautels IDRC Board Chairman. 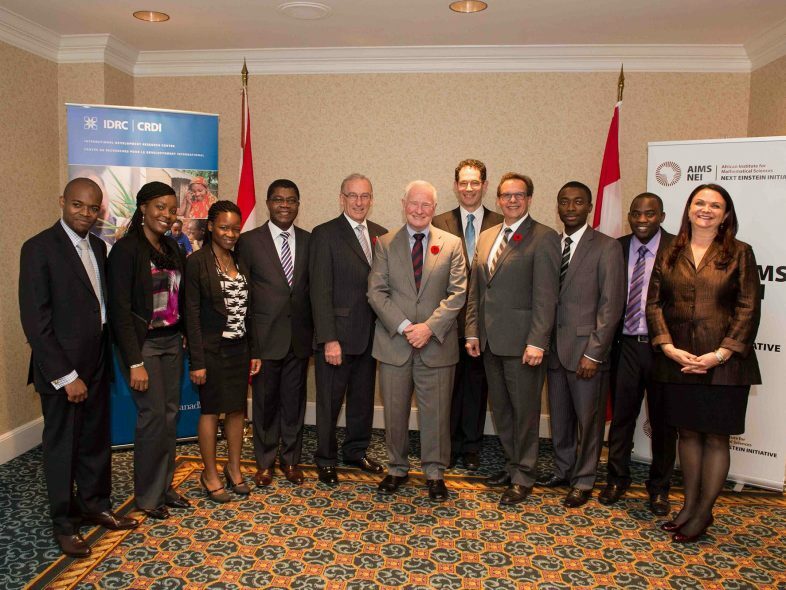 The event featured a speech by Canada’s Governor General, where he expressed his fondness for Africa, education development and celebrated the achievements of AIMS and its alumni. The Rt. Hon. David Johnston recounted memorable moments of his recent visit to Ghana, Botswana and South Africa in May 2013. The African Institute for Mathematical Sciences (AIMS) alumni stole the show at a recent panel discussion - Will the next Einstein be from Africa? - in Canada’s national capital, Ottawa. The event was part of a 10th anniversary celebration and took place in the nondescript headquarters of the International Development Research Centre (IDRC) tucked in behind the stately Bank of Canada on Nov. 7. The IDRC is one of AIMS biggest financial supporters. The discussion was kicked off by IDRC President Jean Lebel and included a brief retelling of the AIMS - NextcEinstein Initiative (AIMS-NEI) story by physicist, AIMS founder and Director of the Perimeter In stitute for Theoretical Physics, Neil Turok; and Thierry Zomahoun, Executive Director of AIMS-NEI and Head of the Global AIMS Secretariat. The audience of development experts, university professors, students and public servants heard the incredible stories by AIMS scholars about how they were able to realize their dreams with the help of the AIMS-NEI and the IDRC. Panel moderator and Maclean’s magazine journalist Paul Wells used probing questions to focus the discussion and open up the conversation. Martial Loth Ndeffo Mbah PhD, an Associate Research Scientist in Epidemiology (Microbial Diseases) at the Yale School of Medicine, told an amazing story of his passion for applied math solving real world problems and his ability to rise to the highest levels of mathematics with AIMS’s support. “I was stuck in my career because there was no applied mathematics programs in my home country of Cameroon,” Mbah told the participants.“ Coming from a poor family and French speaking, I was discouraged until my friend told me AIMS would teach me English and the mathematics I wanted to do, that was the pan-African spirit that drew me in.” Mbah credits the confidence he gained from AIMS as key to his later success at Cambridge and now his post doctorate work at Yale examining the relationship and efficacy between HIV, malaria and schistosomiasis, which affect his community greatly. Marvellous Onuma-Kalu comes by her name honestly. The Nigerian woman and AIMS alumni is studying in the Master’s program in quantum information at the University of Waterloo. She believes this is a new common spirit for young Africans who are determined to follow their own paths to greatness. Onuma-Kalu is part of a new field called quantum information that will develop, design and produce the micro-processors for increasingly smaller and secure computers. AIMS-NEI’s goal is to create the conditions in which the next Einstein can emerge in Africa. The initiative turns development on its head and will see Africa not for its problems, but for the great positive contribution it can make to the world. Realising the talents of its young people will drive progress on the continent, and bring new energy, vitality and diversity into science, stimulating discoveries whose consequences we can only imagine. Let Africa do for science what it has already done for music, art and literature. Watch the complete panel discussion here in English or French. The alumni listed below, along with Neil and Thierry, participated in a panel discussion on the program that was moderated by respected Canadian journalist Paul Wells.